The theme of this year's fest was 'Kairos - the opportune moment' that witnessed over 5000 + registrations, for 7 grand events, from various B-Schools across the country. The shortlisted participants were invited for the final rounds at L'Attitude 2018. Welcoming the chief guest and participants, Dr. Vaidy Jayaraman, Associate Dean & Principal, Great Lakes Institute of Management, Chennai, said "This is the first time in the history of Great Lakes that we have received over 5000 + registrations for our Inter B School fest. The current batch of students have put in a lot of hard work to make this a grand success. Each one of you present here, this is the right moment to meet your peers, faculty and network. As the theme states - grab the moment as this is once in a lifetime opportunity." Delivering the address and advising the students in line with theme, Mr. N K Ranganathan, Managing Director - Grundfos India, said, " To be successful in this dynamic and changing world, first thing you have to do is impact that change in minds of your target audience. Seize the opportunity effectively and execute it to success smartly. As all of you have only few months left to join work, remember successful corporates look for individuals who have ability to communicate, learn, build a relationship with a team, and strong base to stand up on the choice you make." Sharing experience from his professional journey, Mr. N Krishnamoorthy, Chief Quality Manager, Blue Dart Aviation, too advised the students to stay updated on the news and make a right choice to progress in their career ahead. Mr. V M Rajashekaran, CEO - Agarbathi Divisions, ITC Group shared about the growth of Agarbathi market over the years. Despite being part of top brand in the country, the Agarbathi business faced struggles and still stood over time to retain the number one position in the market. He added, "Deep dive in your business, even if you are at peak, be careful and always keep looking at your figures, target, competitors, only then you will feel the drive to take your brand to next level." Post the inaugural ceremony, the event kick-started with series of events. A 'Quiz Pro Quo' was conducted by renowned Quiz Master Mr. Gautam Bose, which was well received among the participants. Two of the major events were sponsored by leading players in the market. Supply Chain & Operations event - SCInnovatia was sponsored by SKCL and Consulting event - Excelsior was sponsored by SMERA Ratings Limited. As precursor to L'Attitude, many competitions were conducted in college such as FIFA Gaming, counterstrike, Redbull Futsal, Lagori and Antakshari, followed by sporting events such as Box Cricket, Men's Kabaddi and Women's Throwball. This led to cultural evening that began with band performances by Great Lakes' own ensemble. For the first time, Great Lakes theatre club 'The Arte' performed an original play, "Covet", filled with drama, dance and music that spoke of love, passion and obsession. The play was followed by a dance performance and ended the night with performances from in house DJs - DJ Subro and DJ Sagnik. On the second day, a "Legends of Tomorrow - One day at a Premier B School" for all aspiring B School candidates was organized that saw participation from various High school and colleges in the city. This year's fest also hosted a Mock UN at the campus on the topic 'Women Empowerment'. 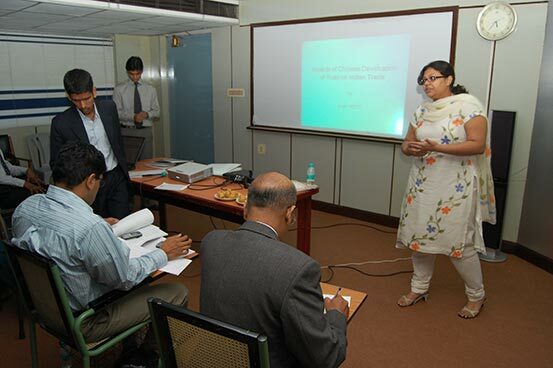 Mrs. Sandhya Shekar, Head - Research Park, IIT Madras was the chief guest. The discussion was a very meaningful one where many questions on women empowerment was addressed. The importance of equi-values over equality, and the directive to "act and not "react" were among the main points discussed. The event came to an end with the valedictory function, presided over by Mr. Sethu Madhavan, MD of Tempel Steel, who also felicitated the winners for each competition. Chennai, January 28th, 2017: Great Lakes Institute of Management hosted its annual inter B-School festival L’Attitude 13°05’. Crafted on a new theme every year, this year’s L’Attitude was based on the theme “AVANT GRADE”, which means new and experimental ideas and methods. The three days annual inter B-School festival featured a potpourri of events and competitions that encompassed various spheres of management education, followed by a cultural night. The inaugural ceremony saw Dr. Bala V Balachandran, Founder, Dean& Chairman, Great Lakes Institute of Management, welcoming the chief guests and participants from various B-Schools. In his welcome address, Dr.Bala said, "Great Lakes has always ensured to stay ahead and relevant and this is evident with our exclusive sessions on contemporary issues in management delivered by Industry experts." Fests such as L'Attitude is an extension of this effort and the theme could not have been more relevant, he remarked. Talking about his journey of Bharath matrimony, it's Founder and CEO Mr. MurugavelJanakiraman told that the boom of dotcoms in the late 90s is what gave him the support to start the venture. “Though we have a lot of competition today, Bharath matrimony's incremental innovation has kept us ahead of the competition. Also, staying a trusted portal is most important when it comes to businesses like ours”, he added. The event had bigwigs from industry and academicians as judges for various competitions that happened over the three days of the fest. Dr. C K Gandhirajan IPS, ADGP, Tamilnadu Cadre inaugurated a model United Nations session and the session saw mock assembly debate by the students of Great Lakes. Mr.PrabhatPani, Director, Tata Trust andTan Dato’ Dr. R.Palan, Pro Chancellor, Cyberjaya University of Medical Sciences, Malaysia, were the guests for the valedictory. They presented awards and certificates to the winners of various competitions. L’Attitude had over 1500participants from premier B-Schools and Engineering and Arts Colleges in India competing in various competitions. The competitions included Data Tales (Analytics), Invader (Marketing), Exuberance (Finance), SCInnovatia (Operations and Strategy), Excelsior (Consulting), and Spandan (Social Entrepreneurship. The event also had a quiz session conducted by renowned quiz master Gautam Bose. The cultural nightthrilled all the participants and L’Attitude concluded on a high note with some amazing performances by Great Lakes students. It included skits, fashion show, and some exhilarating live band performances; enjoyed by participants from other B-Schools and Great Lakes students alike. The event was presented by TVS in association with Uniply and powered by VH1. The two day event featured events and competitions that encompass various domains of management education, followed by a cultural night. Over 90 teams from top B-Schools in India such as IIMs, IITs, MDI, IIFT, NMIMS, TISS, SIBM, Delhi School of Economics participated in this year’s event. Chennai: January 9, 2016: Great Lakes hosted its two day annual inter B-School festival L’Attitude 13°05’. Crafted on a new theme every year, the 9th edition of L’Attitude was based on the theme “Impresa – do the new”, which means to start a new venture with the motto of success. 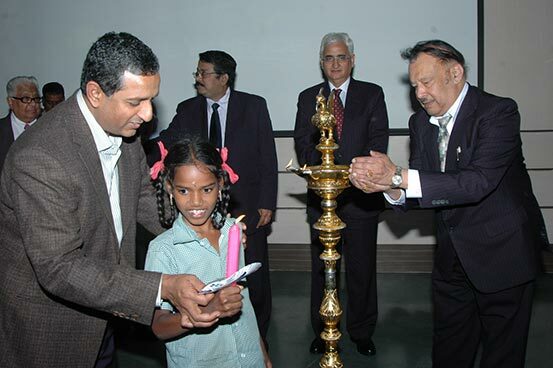 The event had bigwigs from the industry and renowned academicians as chief guests. Mr. S. Premkumar - Executive Vice-Chairman and MD, HCL Info systems & Chief Mentor, HCL TalentCare Pvt Ltd, Prof. Krishna Erramilli – Associate Dean & Professor of Marketing, Stuart School of Business, Illinois Institute of Technology and Mr. Shah Talukder Co-founder & CEO, Yaskee were the guests. The inaugural ceremony saw Dr. Bala V Balachandran, Founder, Chairman & Dean, Great Lakes Institute of Management, welcoming the chief guests and participants from various B-Schools. In his welcome address Dr. Bala V Balachandran said, “Annual B-School fests such as these are a platform to present and discuss ideas relevant to current business scenario. Startups with powerful ideas disrupting the market like never before, the theme could not have been more relevant.” And that is why the launch of Yaksee, an interactive broadcast platform which has been supported and sponsored by Great Lakes will be another high light of this year’s L’Attitude, Dr. Bala added. Speaking on the occasion, Chief Guest Mr. S. Premkumar said, ““I find the theme of this event “IMPRESA” very relevant. This truly is a time of disruptive innovations. If your business is not disrupted by these innovations, then you can be sure that something is wrong.” For all the budding entrepreneurs here, I would recommend you to be conscious of customer experience. Respond to your customers’ situation and that is the key to success, he added. The inaugural session was followed by the formal launch of Yaksee, first-of-its-kind interactive broadcasting platform in India which makes remote learning interactive. L’Attitude had over 90 students from various B-Schools in India competing in various competitions. The competitions included Invader (Marketing), Exuberance (Finance), SCInnovatia (Operations and Strategy), Excelsior (Consulting), and Spandan (Social Entrepreneurship. The event also had a quiz session conducted by renowned quiz master Giri Balasubramanium. Prizes were distributed in the valedictory ceremony to the winners of various events. The cultural night thrilled all the participants and L’Attitude concluded on a high note with some amazing performances by Great Lakes students. It included skits, fashion show, and some exhilarating live band performances; enjoyed by participants from other B-Schools and Great Lakes students alike. Great Lakes hosted its annual inter B-School fest L’Attitude 13⁰05’ on 5th and 6th of December, 2014. The eighth edition of the most anticipated Fest was based on the theme ‘En route India- Harnessing the Indian-ness’ and saw a participation of 1080 teams from various B-Schools across India including the IIMs & IITs. The most awaited event started with a CEO’s conclave. Shri N S Rajan, Chief Human Resources officer and member of the Group Executive Council of Tata Sons, Shri Srini Raju, Founder & MD, Peepul Capital Advisors Pvt. Ltd. inaugurated the Fest and a special address was delivered by Shri Robin Singh, Cricketer and Coach – Mumbai Indians. Delivering the chief guest address on the theme of the event, Shri Srini Raju said, “Indian-ness is a way of life and is little understood by westerners who confuse it with Religion. Indian-ness is based on flexibility and tolerance than being binary.” It is nor 0 or 1, he added. The cultural night saw Sunburn entertaining the students on the end of day 1 and gearing up for the series of competitions on the next day. The seven formal events Marketing (Invader), Finance (Seeking Alpha), Operations (Nirnay), Social Cause (Spandan), Consulting (Excelsior) and Economics (Arthayuga), National-level Quiz (QuizProQuo) saw participations from students of various premier institutes in the country such as the IIMs, XLRI, ISB, MDI, SP Jain, NMIMS, SIBM, SCMHRD, FMS, IITs etc. A total of 100+ colleges and over 3000 students partipated in the B-School fest. Dr. Navin Jayakumar, one of the most celebrated quizmasters in the country hosted National-level Quiz (QuizProQuo) at the mega Fest – L’ATTITUDE 13°05’. It was a generic quiz with business flavour designed to discover and reward the best quizzing talent among Indian Corporates, undergraduate and postgraduate schools. Great Lakes organized its annual B-School fest L’Attitude 13° 05' on January 10 & 11, 2014. This year L’Attitude saw over 2984 registrations from Top B Schools across the country competing in different competitions. The theme for this year was ‘MUTATIS MUTANDIS – Lead the Change, it is time for young leaders and scholars to identify elements and solutions that can transform India to an imperial power it once was. The event started in an auspicious way by the lighting of the lamp followed by an invocation song. The chief guests D. Shivakumar, Chairman and CEO, PepsiCo India and Shri. Suresh Prabhakar Prabhu, former minister and member of Lok Sabha, were welcomed by Dr. Bala V Balachandran, founder and dean of Great Lakes. In his keynote address, Shri D. Shivakumar, Chairman and CEO of PepsiCo India Holdings Pvt. Ltd, India, shared and discussed about his ten rules of change management. He discoursed that companies could fail only because of two reasons; Arrogant Leadership and Inability of the company to change. He discussed on the necessity to embrace change and avoid change fatigue in order to sustain in the current business scenario. Speaking on the occasion, Shri. 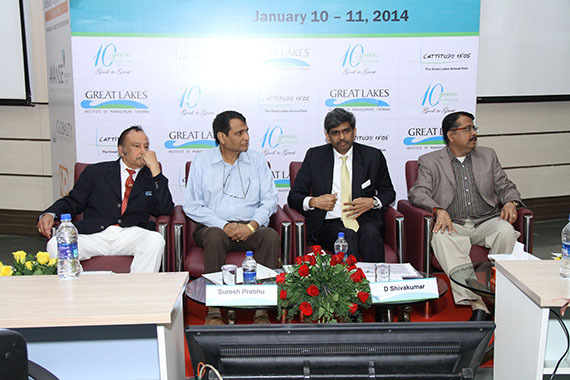 Suresh Prabhu, former minister and member of Lok Sabha, congratulated Great Lakes for its ten years of excellence. He said he strongly believes that year 2014 will be a mile stone year in the history of India as the country is preparing itself for a change in political and economic scenario. He imparted the need for a civil society in the country which is as important as legislation, judiciary and bureaucracy. The event also hosted a CEO conclave on the theme Leading and managing change in the VUCA (Volatile, Uncertain, Complex and Ambiguous) world. The CEO conclave had a panel discussion which included Dr. Shyam Sunder, James L. Frank Professor of Accounting, Economics and Finance, Yale School of Management, Shri. Balaraman Jayaraman, Co-founder and President of Congruent Solutions Pvt Ltd, Shri. M. Kalyanaraman, COO of TVS Credit Services Limited and Shri. Keshav Narayanan Kantamneni, founder of Globality Partners. The discussion was moderated by Prof. Easwer Krishna Iyer, Associate Professor-Marketing & Director – Admissions at Great Lakes. The inauguration concluded with a thank you note presented by Prof. Sriram, Executive Director, Great Lakes Institute of Management, where he thanked every individual involved in the process of making L’Attitude 13° 05' a grand success. He specially thanked the chief guests of the occasion for inspiring the audience with their commendable speeches. Day one of L’Attitude 13° 05' also had a fun filled cultural night with some entertaining performances from Great Lakers. The event was filled with dance forms like Bhangra, Hip-hop and Shadow dance by Great Lakes’ Parchaayi group. Music bands of Great Lakes “The Beloved Nephews” and “Aatman” were at their entertaining best. The high-light of the cultural event was the live Raghu Dixit Project. The two day festival had eight events with 2984 Participants followed by 16 Winning Teams. The competitions in the events were iHuman (HR), Finovate (Finance), Invader and Socialite (Marketing), SolVeda (Consulting), Bspark (Under-grad), Nirnay (Operations), Spandan (Social Challenge) and Arthayuga. L’Attitude 2014 concluded with the valedictory ceremony. The session was graced by Mr. Sandeep Dhar, CEO, Tesco India and Mr. A Mahendran from the Godrej Group. Theme: Business Darwinism -‘Be distinct or extinct’. The idea of business evolution is natural; businesses in keeping with Darwinian principles of ‘Being distinct or extinct’ either beat the competition, or find themselves beaten. Many follow, but only a few lead. Many compete for survival, but few compete for excellence. We constantly strive to be seen, heard, and be deemed relevant. The future of business comes down to one word - DISTINCTION. Business Darwinism is real, and is acquiring admission to the managerial psyche in several forms; but the question is - are we ready? 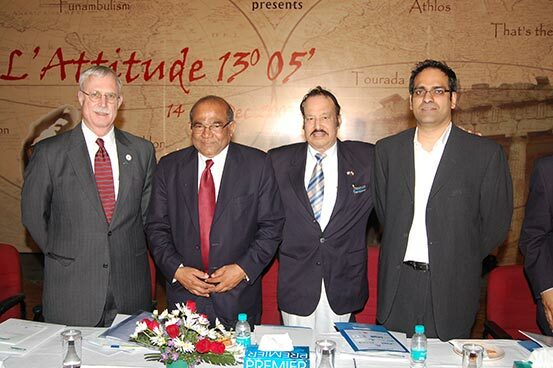 Keeping this concept in mind, Great Lakes organized its annual fest L’Attitude 13°05’ on January 29 & 30, 2013.The event started with the announcement of opening of L’Attitude by Dr. Bala V. Balachandran, Founder & Dean – Great Lakes Institute of Management. He also delivered the welcome address where he spoke about the theme of the event – ‘Be Distinct or Be Extinct’. Dr. Bala spoke about the competitive business scenario today and how not keeping up with innovative business models and changes can ruin a business. He added that businesses which do not keep up with better governance and smaller environmental foot prints would be forced to extinction. Mr. Paranjpe also emphasized on the significance of Moral Quotient of today’s managers. He said, “Managers today are recruited not just for their IQ (Intelligence Quotient) or EQ (Emotional Quotient), but also for their Moral Quotient (MQ). The Second day of the event had a CEO Colloquium which included a lecture by Shri Shanker Annaswamy, Managing Director, IBM India Private Limited. Dr. S. Elankumaran, Professor – Organizational Behaviour & Business Ethics, Great Lakes Institute of Management, proposed the Vote of thanks. 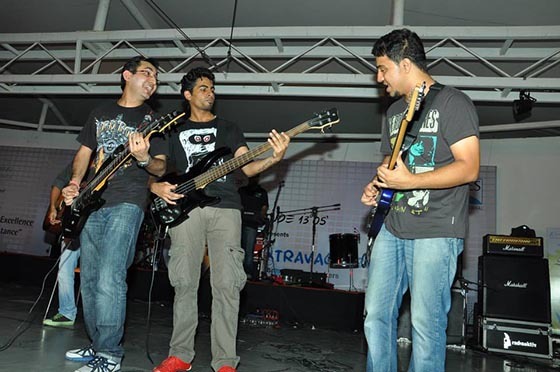 The event had a fun-filled cultural night with a live performance by ‘Parikrama Band’. Theme: "Envisioning Emerging Economies…Thinking beyond Tomorrow"
L’Attitude 13°05’ happened on January 19, 2012 on the theme “Envisioning Emerging Economies…Thinking beyond Tomorrow". Dr. Bala V Balachandra, Founder & Dean at Great Lakes Institute of Management welcomed the chief guests and declared the event open. Dr. Tapan Panda, an eminent professor of marketing at Great lakes and an awardee of the Devang Mehta for the best teacher was the moderator for one of the events namely “CEO Conclave”, which included a panel discussion between the four chief guests. Prof. Tapan stated the impact of emerging economies in the new global order and further signified that the sustenance of an economy as a major factor in identifying the closure or opening of western businesses. The topic for the panel discussion was "Reaping the demographic dividend: What’s wrong with the Indian MBA education?" Mr. AllwinAgnel, Founder & CEO, Pagalguy.com, sketching his career choices of serial entrepreneurship, touch based upon the key aspects of MBA education which influences the way it shapes out in India. He spoke how students are more concerned only on the ROI. The second focus of his perception was that education cannot be the sole torch bearer for the changing of mindsets. He said that individual choices would decide the future of India and not what is being taught in classrooms. Mr. Amit, chairman of MBA Universe questioned the reasons for falling MBA enrollment when there is an increase in figures of growth of India as a country. The prime five reasons for this state of affairs he stated was i) higher-education policy myopia ii) complacency in being top 25 Indian B-Schools in a rapidly globalizing management world iii) lack of segmentation of MBA market iv) absence in bench marking industry skill-set v) mismatch in input process output cycle in 90% Indian B-Schools. Mr. Prabhat Kumar, Director of BHAVINI discussed the power scenario of India post-independence and how it has grown in the due course of time. He stated that "One has to look forward to something different, which does not disturb the nature, which is sustainable"
Mr. Daniel Heiser, Associate Dean, DePaul University, College of Commerce, Chicago - signified that India falls under the third sector in the measure of doing business in comparison to the rest of the world, pitching in the establishment issues and the growth prospects of businesses and new market opportunities. Eminent industry personalities and leading film directors made their presence at Great lakes campus to judge the series of competitions in their respective fields - Marketing, Finance, Operations and HR. There was total count of 1500 registrations from premier B-Schools across the country. The multitude of events saw over 100 finalists competing for various events. Dr. Bala V Balachandran, Founder & Dean at Great Lakes Institute of Management welcomed the gathering and declared the event open. The Honorable Chief Guest of the event was Shri. Salman Khurshid, Minister for Corporate Affairs, India. Speaking on the event. Mr. Khurshid remarked that he has visited the campus this time in dual capacity.“I have come here today representing the Government of India in two ministries; corporative affairs and minority affairs”, he told the gathering. He spoke about current corporate scenario, Government organizations, mergers and acquisitions and the link between all these. Specifically talking on the ‘Satyam issue’, Mr. Khurshid told how India swiftly responded to the issue. He added that what could have become an embarrassing part of Indian corporate history has now become a case study of how you move from crisis to confidence. The cabinet minister answered to the questions from students on various issues like Reservations, Corporate Governance, Navaratnas etc. The event also saw Key note address by astellar assortment of corporate leaders. The tireless efforts of the organizing team of Great lakes culminated by hosting other B-School teams to a Rock show by the college band - Straight F.
L’Attitude 13°05’, the annual B-School fest at Great Lakes, this year synthesizes the best of the East and the West which is reflected in the motto "Global mindsets, Indian roots". This year the event draws inspiration from Ancient India. By establishing oneself in the earnestness of noble pursuits, it is possible to transcend the temporal self, limited by desires, fears, memories and mental constructs, and gain blissful immersion in pure consciousness. The act of acquiring this state is both a sublime art and an exact science. At CEO Conclave, the powerhouses of the business world came together, to provide the best mix of perspectives on the major challenges facing business and industry today. Together, the chief guests debated the contemporary issues and emerging challenges in the corporate domain. They shared their vast experiences, their successes as well as their failures and enriched all with their thoughts. Kaalteet - B-Plan competition: Kaalteet stands for "something which is beyond time". It requires quite a bit of motivation and clarity of thought to innovate and devise a B-Plan which may stand the test of time. It further demands expert vision and mastery of varied fields of management to keep it thriving. Arthashaastra - International B-Plan Contest: Arthshaastra stands for “studying the business of production, distribution, and consumption of goods and services”. Kumbhaka - Operation Strategy Game: Kumbhaka is the toughest strategy of retention of breath which evokes the spiritual energy lying dormant in all individuals. Mastering it has been the prime concern of all ancient yogis. Dvija - Relaunch of failed: Dvija is the re-launching of a product which unfortunately had failed in the market. Any product re-launch, requires that we learn from the past, do not repeat the mistakes and get a better understanding of the customers & competition through a detailed analysis of the market forces then and now. Rahasya - An Online Cryptic Game: A mystical teaching which has captured the minds of people since eternity. This form of secret wisdom is coveted by all. JIGYASA – Curiosity that motivates investigation and study is the natural condition of one's mind. Source knowledge from all avenues and be a part of a challenging quiz which would essentially be based on the happenings in the business world around us. L’Attitude 13 ‘05 unfolds in 2007 and the first event for the academic year 2008 was organized with the theme slated as “Ancient Games”. The event was inaugurated by a galaxy of stars from the world of business and academia. The two day festival involved power talks by eminent personalities, events & competitions being judged by an esteemed guest of panelists. Added to this was also the launch of MARG – Great Lakes Centre of Infrastructure Excellence which was inaugurated by Dr. N. R. Narayanamurthy, Chairman, Infosys Technologies and the launch of Great Lakes Magazine namely “Gravity”. The business quiz was conducted by Mr. Giri ‘Pickbrain’ Balasubramaniam - Head Greycaps India Pvt Ltd; India's second largest quiz company. The winning team bagged an amount of Rs. 30,000 and runners up Rs. 15000. The evening was capped with a truly phenomenal performance by one of the greatest Indian keyboard players, Stephen Devassy and a rocking show by LBG (Little Babooshka's Grind).